Gone are the days when fluorescent lightning was the most common light used for plant supplementary lightning. Nowadays, besides LEDs, you'll encounter high-intensity discharge (HIDs) in any commercial grow lights. Hobbyist growers also have great results with HPS as well. Known for their high light intensity and PAR output and a great pairing with Metal Halide lights, it's no wonder that HPS will still have their place in any modern growing systems. 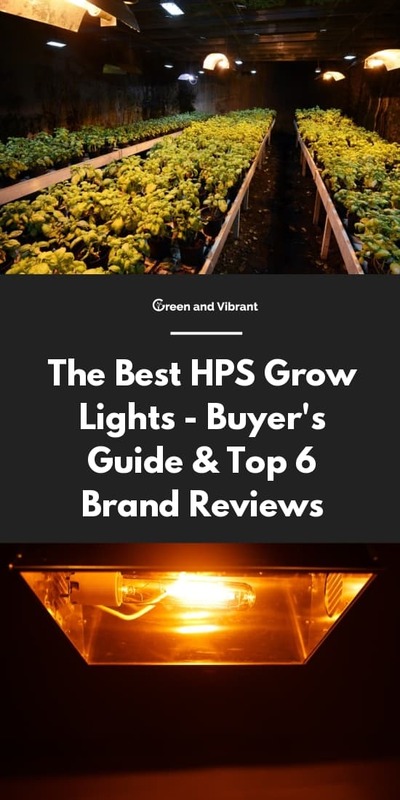 To help you make a better decision before getting an HPS bulb, we put together a buyer's guide here covering lots of essential factors. This is done with in-depth research and evaluation, and discussions with some seasoned indoor growers. You can find below our top HPS grow light brands and bulbs that we handpick. It's not an easy job since there are lots of HPS manufacturers. But as said, we have done hours of research, evaluation and talked to some experienced hydroponic growers to make this shortlist. Eye Hortilux is the top premium brand in the horticulture lightning, and they're in the grow light market for about 20 years. When it comes to Lumen, and PAR output, Eye Hortilux HPs bulbs always hit the top. They show the highest PPFD in the tests done by some growers and manufacturers you can search online. These lamps generate great results for a heavy grow, especially flowering phase. The products are made in the USA and come with a 1-year warranty just like other HPS manufacturers. There are some differences in the prices between Eye Hortilux and other HPS light brands. But if you're looking for a quality HPs bulb that can maximize your plant yield for several grows, Eye Hortilux is a reliable choice. The downside is its price. When you have to replace your HPS after several grows or every 9 - 12 months for the standard performance, these bulbs will cost you more. However, you do have to pay for high quality these days. There are a variety of options from 400W to 1000W traditional HPS bulbs to the double-ended HPS bulb. Ushio is a less popular brand than Eye Hortilux when it comes to HPS lightning. But they are another premium product in the HPS grow light market. These lights also come near to Eye Hortiuflux in terms of bulb quality and PAR output. This quality makes them great for plants during the flowering stage. If you are sensitive to the prices but still look for a quality bulb by a premium Brand, Ushio is a good choice since it's a little bit less expensive than the Eye Hortiflux, which can save you a couple of bucks after several grows. Digilux is the HPS brand by Hydrofarm, a Chinese grow-light manufacturer. They tie with Ushio regarding price and quality. Overall, these are still good HPS grow lamps, but they are a less popular premium brand than the two above. They produce intense red and orange colors, and some other spectrum wavelengths which suit plant's flowering period as well as the other phases. They do not emit as high as PPFD as Eye Hortilux but are still the top PAR output compared to other HPS counterparts. These bulbs are made to use in the digital ballast and have a 1-year warranty. There are also growers who look for an affordable bulb as they have to replace their HPS grow lights every so often. Fortunately, there are still lots of brands and HPS bulbs on the market offering a very cost-effective price with acceptable quality. Read below for these budget HPS lights. Yield Lab is the indoor grow supply brand by Grow Ace. They did a test to prove that their HPS light was on par with the Ushio and Digilux HPS regarding the PAR efficiency for a much better price. On the whole, this is a best-valued HPS bulb option if the price is your top criteria. However, they are not as favored by users as the Eye Hortiflux and Ushio. And even though the Yield Lab manufacturers did the test to show their high PAR output, it's hard to justify the bulb quality over time. No one wants to have a failed bulb in a middle of a grow because they buy a cheap instable lamp. So, you may consider a bit of a risk when getting a product from a less-known brand. There are other budget options on the market as well, including the iPower and Apollo Horticulture HPS. They all come with all wattage options and most importantly a very competitive price. These HPS bulbs from the Chinese manufacturers are still among the most popular HPS lights for growing indoor plants. They do not have a top PAR efficiency but what makes them preferred by some growers is their inexpensive price while the bulbs still produce some fair results. After all, you have to replace the bulbs after several heavy grows. Then getting a budget bulb can save you a lot in the long run. But when doing this way, you have to accept a less quality crop yield or the chance of an unexpected bulb failure that may happen. 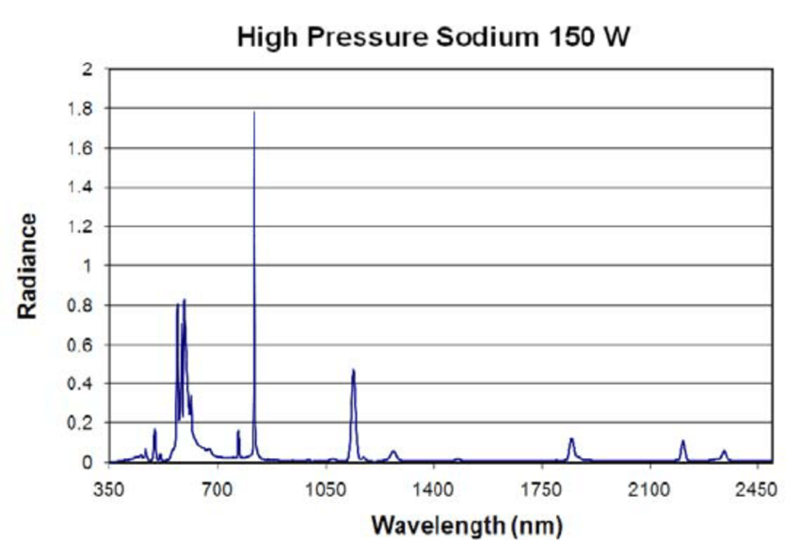 HPS, which stands for High-Pressure Sodium, is a type of light that contains a narrow arc tube held by the wire frame. 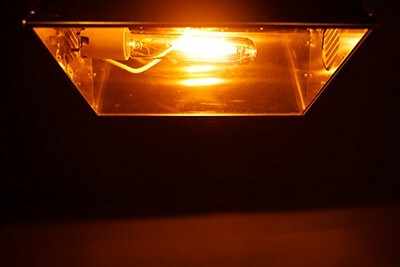 This light contains high-pressure solid sodium, xenon gas, and mercury inside of it. When the power is turned on, an external ballast creates a high-power pulse that stirs the filled gas. Xenon is ignited first, and a strong flow of electrons is generated. The arc then heats up and has a faint bluish light from xenon gas. Heats from the arc subsequently vapor the liquid mercury into gas, generating more bluish color. Sodium is the last gas to be vapored at approximately 240oC. Heats from mercury and the arc turn sodium into a more yellow-color spectrum. The final quality colors aimed at indoor growing as we see are the blend of the three components above. HPS has mostly red or orange light spectrum and so are ideal for the flowering phase of the plant’s lifecycle. Of course, you can use HPS for all of your plants grow phases. Many have done that and still enjoyed some fair results. But for better results, growers often supplement it with other grow lights. Of them, the most commonly used are Metal Halide Lights. These MH lamps generate more white-blue colors and hence make a more balanced output of light spectrum for your plants. The cost per output wattage is averagely less than other types of grow lights. HPS bulbs are more affordable than LED lights. Their color wavelengths are ideal for the flowering and budding stage of plants. HPS grow lights lack the blue color spectrum which is important for the plants’ vegetative stages. The light can produce damaging heat which can burn plants. So an appropriate distance and cooling methods are needed. HPS bulbs require a ballast to get powered and a reflector to improve focus. You need to purchase an HPS grow light based on your indoor garden setup. When you do, you make the most out of your grow lights. As a result, your plants will flower better than you can imagine. This is a general recommendation as the canopy of the plants’ genetics and plant types have different endurances to light intensity. Your HPS grow light will never work without being powered by a ballast. So make sure you choose the right one. 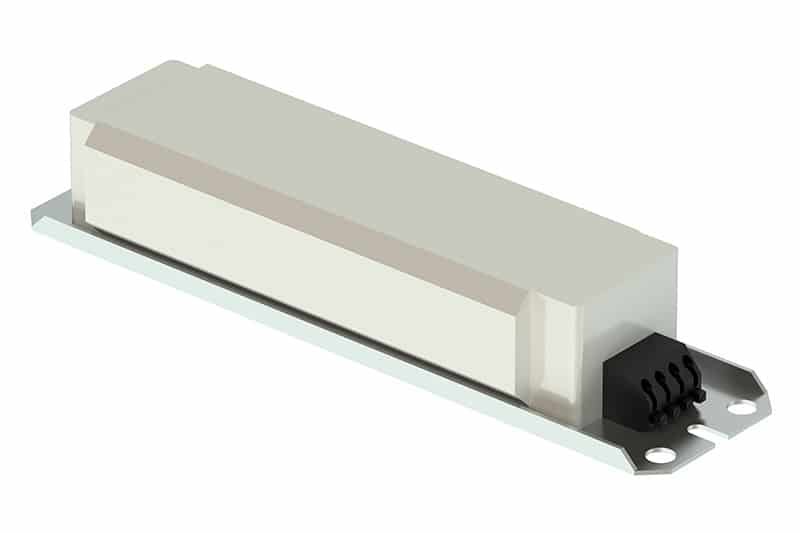 Some important criteria of a good digital ballast include a great range of dimming ability, bulb protection, radio frequency shielding. And finally, flexibility is also very important because you can run different wattages or use MH later. The use of a reflector not only helps you can improve the focus of your HPS light, but it also saves your bulb life in the long run. Commonly, there are two types of reflectors to choose. Each has different characteristics which are suitable for the different types of setups. Open: These open reflectors are built to make sure your plants get as much as light as possible. They also have the adjustable feature, which helps you place the light far or near your plants. Air cooled: This type captures hot air and keeps it away from the plants. They can also hook to an air duct exhaust. This type of reflector is ideal grow tent and enclosed spaces. Single-ended (SE) HPS bulbs look just like the standard incandescent bulbs invented by Thomas Edison that you commonly saw in your homes years ago. However, they use a larger socket, which is called a Mogul base. Inside this glass tube, there is a part, called the arc tube, whose main function is to manufacture light. It gets the energy from the base of the bulb connected by a metal "frame wire" at one end. DE HPS have grown more popular among hobbyists in past years even though they have been used in commercial production for ten years or so. The question is whether DE HPS are more worthy than SE HPS? Without hesitation, I can say that it's worth for several reasons. It's spontaneously thinner than SE bulbs. The DE bulbs create a more even and smoother emission of light than SE bulbs because of its lack of the wire frame and its thinner shape. DE lamps are filled with nitrogen gas instead of vacuum like SE bulbs. The gas helps the bulbs generate lights more efficiently with a higher temperature. DE bulbs are known for higher durability. They degrade much slower than SE counterparts. However, you have to face one truth is that DE HPS bulbs are still not as popular as single HPS bulbs. Probably, it is due to their high price. Even though they produce higher PAR output than traditional ones, there is a leap in their price. And the fact that you still have to replace your lamps after several grows makes you consider before purchasing DE bulbs. And most users have been accustomed to the traditional HPS for so long. So SE bulb will continue the top used for a long time. If you have trouble choosing the one for you, we recommend the Eye Hortilux HPS enhanced bulb. Their high-end bulb quality and PAR output help you enjoy an effective grow every time. Other cost-effective HPS grow bulbs like Yield Lab, Apollo Horticulture, iPower don't compete with the Hortilux regarding quality, but they still have a spot for budget growers with their highly competitive price.